Although I truly believe that giving at anytime is a good thing, I guess there are certain occasions that are more “giving oriented” than others. Birthdays, Valentines day, anniversaries, graduations, weddings, etc. This time of year the occasion, of course, is Christmas. I have to admit my gift giving load is very light compared to other folks – I only have one person to consider – my wife, Regina. Even though that may seem like a light load, believe me, it is a daunting responsibility. I will apologize in advance for tooting my own horn, but this year my gift to Regina was sort of awesome. (Yes, she has already received it). For several years, Regina has been interested in doing tapestry weaving. She has taken classes from several different artists, both in their studio and on-line, and has done some very nice work. This past year, she applied to the American Tapestry Alliance to be accepted into their mentoring program. Not only was she accepted, but she was assigned to a mentor for whom she had already developed a deep admiration. 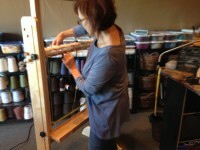 As she worked with this mentor, it became more and more apparent she would benefit from using a different type of loom for her work – a vertical rather than horizontal oriented loom. She searched and found the type of loom she wanted, only to discover they are no longer being built. Even the web-site that supposedly had some for sale, became a virtual dead-end. Meanwhile, back at the ranch, I had contacted her mentor to request assistance in determining some gift I could give her that would make her tapestry work easier or more productive. 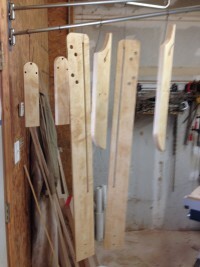 Then came the e-mail from her mentor, who asked, “Would you be interested in building a vertical loom for Regina? 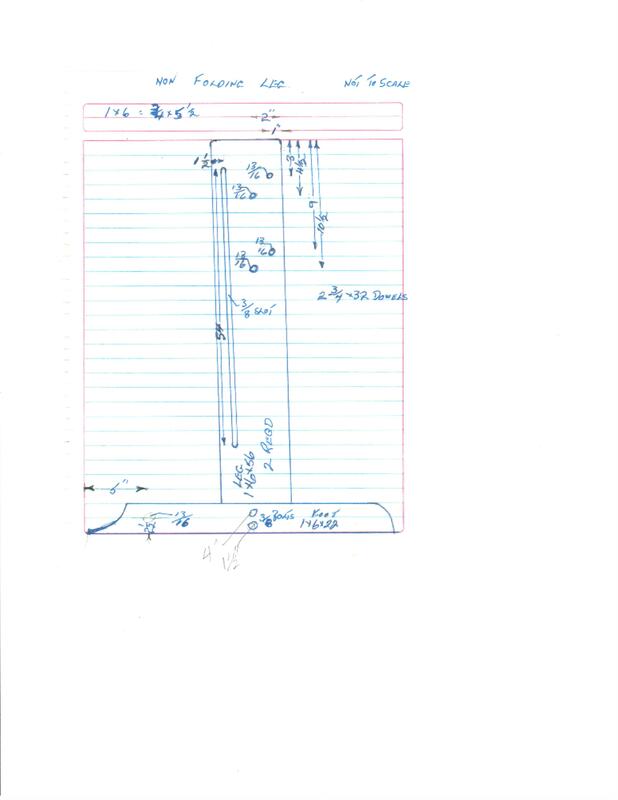 My partner Don has built several, and has the original plans for the exact loom in which she is interested.” WOULD I? YES! YES! YES! Actually the original plans were in Canada, where they had been living, but they were in Mexico at the time. No problem. 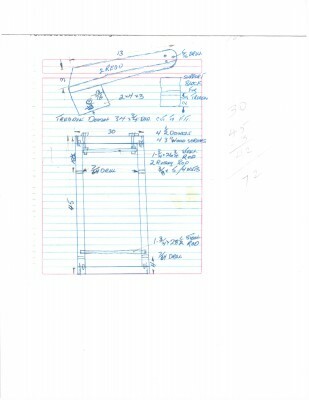 Don would send me drawings and measurements and instructions. 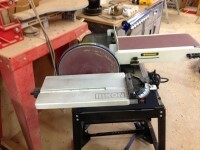 As you may know, I am a woodturner and am not real comfortable with “flat work”, but have some equipment in my shop that can be used for that type of woodwork. 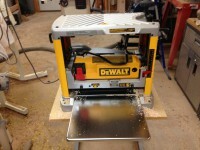 A wonderful by-product of this project was the necessary purchase of two additional power tools for my shop – a planer and a belt sander. 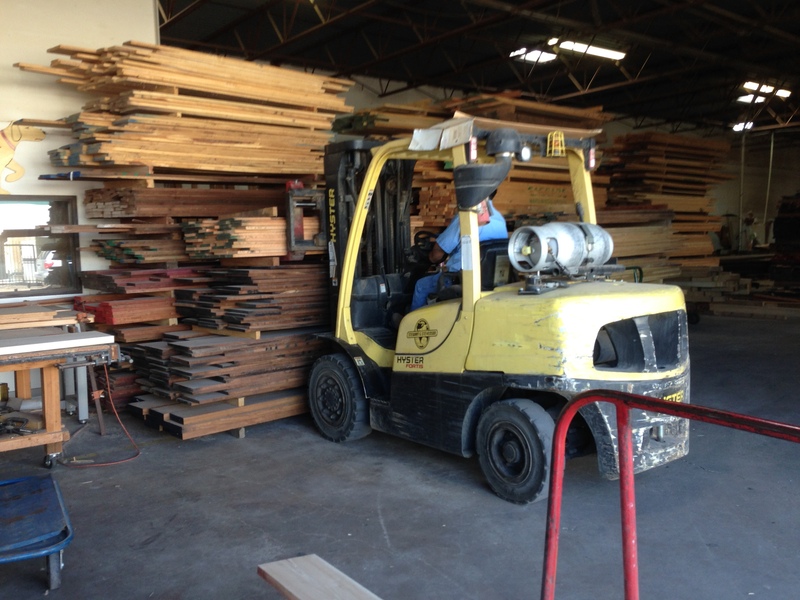 So, I went to the hardwood lumber yard to purchase some hard maple. This stuff is really hard, but necessarily so for such a project. I love this place. Tons of wood. 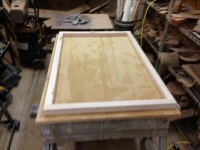 I planed, cut, sanded, finished and assembled according to Don’s drawings and instructions. Some of the steps were easy, some were a real challenge, but I love a good challenge. There were a bunch of questions and answers e-mailed back and forth. Some steps I had to work out at three o’clock in the morning as I lay awake in bed, but what the heck, it had to get done. The result. 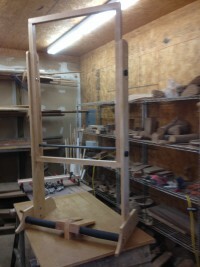 A vertical floor loom for tapestry weaving. Thanks Don and Elaine. Merry Christmas, Regina. This entry was posted in Learning and tagged American Tapestry Alliance, anniversaries, belt sander, Canada, Christmas, flat work, graduation, hard maple, Mexico, planer, tapestry, Valentines, vertical loom, weaving, wedding, woodturning. Bookmark the permalink. My husband is one of the most creative gift givers. I am truly humbled to have in my life. This one ranks right up there with the surprise trip to New York to see the Rocketts and the 12 days of Christmas gifts. I wish I could say I have always been a good girl and deserved his gifts, but I am a Gemini and sometimes that other part of me shows itself. In case some of you don’t know, this comment is from Regina, and she is talking about me. Thanks RK. Troy, I don’t know you are going to top this gift, but you will find a way! I am looking forward to seeing it. Thanks Marsha. I will try to do better. A great person making a great gift for another great person . Thanks Gary. We think you are a great person also. Yes, there is definitely a lot of love going on. Thanks for the comment, Fay. Hello Brother, and a happy Thanksgiving to you and Regina and your 40 acres of frolicking pets. So I was wondering as I travelled the highways and byways when the next blog would appear. It has been missed. Thanks for writing them, it keeps me in touch with your thoughts. Your latest blog I think tells it all. What a thoughtful, magnificent gift of love. Your footprint on this earth is surely a gentle one. Isn’t it interesting how time teaches us how to walk that way if we pay attention? I’m off the road until Campbell in January. But I have plenty to keep me busy until then. I’ve sign to do another book of patterns with Fox Chapel. That, and several other commitments and commissions will more than fill my time. Next year seems to be shaping up to be another busy one. As always, I am grateful to have you as my brother, and especially since you give me such thoughtful comments. Have a happy holiday season. Not necessarily smart, but I can follow instructions, sometimes. Thanks for the comment, Sis. 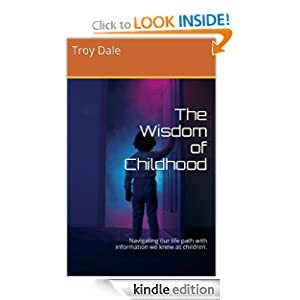 Troy, this is exactly what I needed to read as buy-buy-buy Christmas marketing begins: a gift thoughtfully, joyously created and given; and a gift, I am certain, joyfully received. To me, that is what Christmas is all about. Thanks for a great story that I’ll probably share with anyone who will listen. It was definitely joyously received. The task was challenging, but a whole lot of fun. And I agree that this is indeed what Christmas is all about. Thanks for the comment.